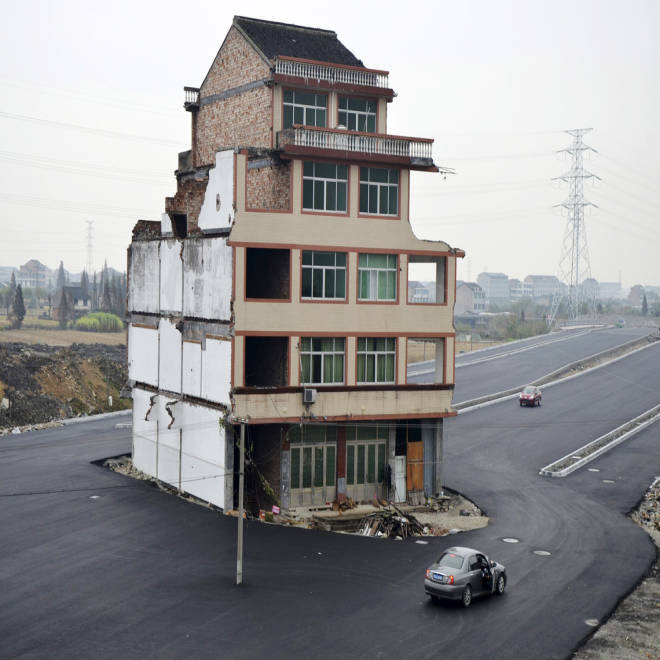 A car stops beside a house in the middle of a newly built road in Wenling, China, on Thursday. Two couples have refused to agree to allow their homes to be demolished. BEIJING – In the “there today, gone tomorrow” world of Chinese construction, entire communities can often disappear and be replaced by high rises or other public works in a matter of weeks or months without any sign of its past residents. Not so for the drivers on this new road in China’s eastern province of Zhejiang. Municipal officials in Wenling had been planning a new access road that would lead to a new railway station just outside the city.To make way for the road though, city planners decided they would have to tear down a section of homes in the nearby village of Xiazhangyang that were in its path. Through methods that range at times from fair compensation all the way down to cajoling, intimidation, beatings and forced evictions, local governments tend to get their way when they have their hearts set on projects. However, every once in a while, even after the majority of landowners in an area are persuaded to give up their property, one or two steely owners will stand their ground either on principle or determination to squeeze out more compensation from the government. These lone homes that stand in the way of progress have been nicknamed “nail houses,” on account of the difficulty in prying them out of the earth. In this case, two families who occupy this five-story building have refused to hand over their property, arguing that the compensation being offered by city officials was insufficient. The financial motivations for these nail house owners to hold out are understandable: Real estate prices in China have skyrocketed in recent years due in no small part to inflation and a lack of other financial vehicles for Chinese to invest their money here on the mainland. Insufficient compensation from local officials then would make it extremely difficult for homeowners to buy new properties in the areas they live in now, much less closer to the cities that have swallowed up their homes. Perhaps wary of looking like they are bullying residents, Wenling officials have gone to the building owners with offers, but have been roundly rejected each time. Nevertheless, in a sign of the times here, the government went ahead with the road, simply building around the dilapidated structure. The road has yet to be officially opened, but homeowner Zhang seemed optimistic about his plight.